I hope all of you had wonderful weekends. We had a relaxing one at my parents' river house with a bunch of friends from Richmond. We absolutely love going to the river. It's such a treat to have that place available and be able to go often - thanks Mom and Dad! There's really nothing better than getting away for a couple of days with great friends! 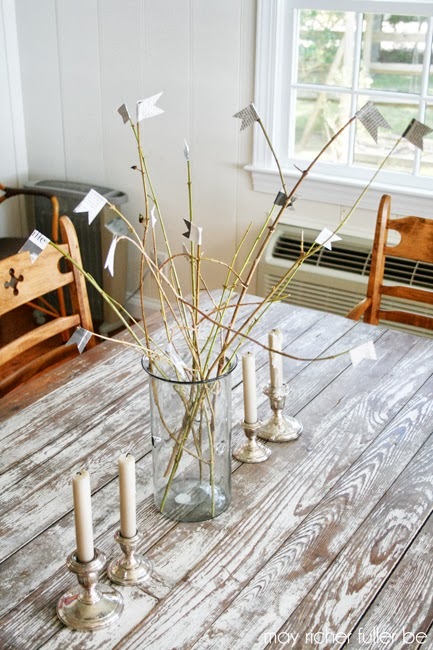 I did manage to sneak a project in while we were there and I'm excited to share this simple DIY centerpiece with you today made of twigs and little paper flags. It's a low effort, high impact kind of project, and I'll bet you already have the supplies you need on hand to make it. And though I refuse to even mention that fall is coming (I'm a summer gal all the way) until after Labor Day, I think this little DIY is a perfect transition piece from summer to fall with its neutral color palette. The house is surrounded by woods, so I just took a little stroll around outside and gathered some twigs and branches for my project. 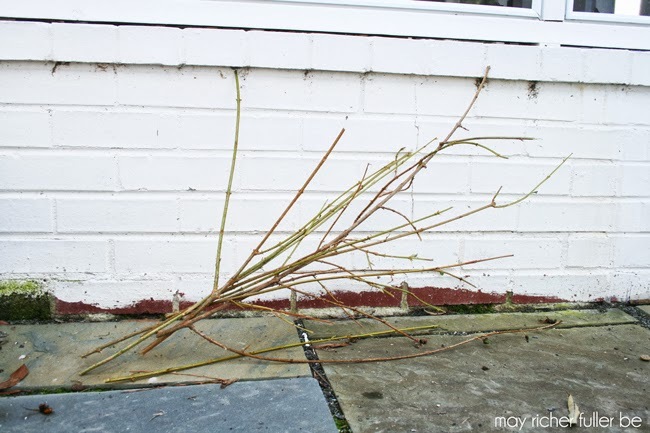 I grabbed a mix of single twigs and branches. 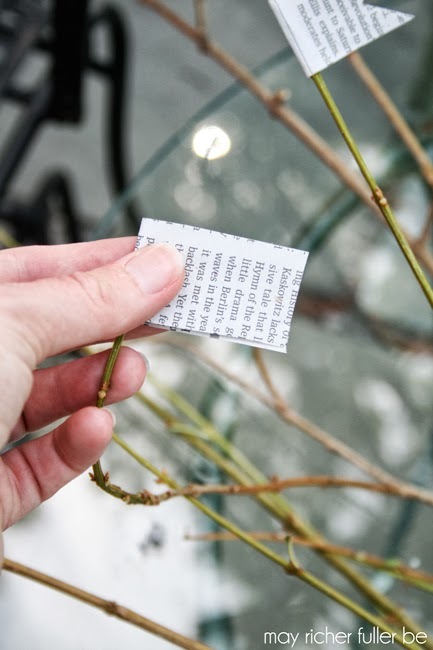 We already had the newspaper, tape and scissors on hand (and I'll bet you do too!). 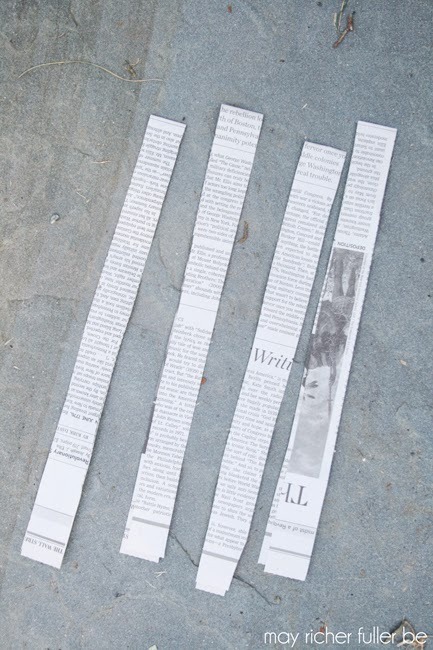 Step 2: Cut strips of newspaper for the paper flags. I probably don't need to do much explaining on this step :). I used newspaper, but you could use any paper you'd like. Old book pages would also be great. 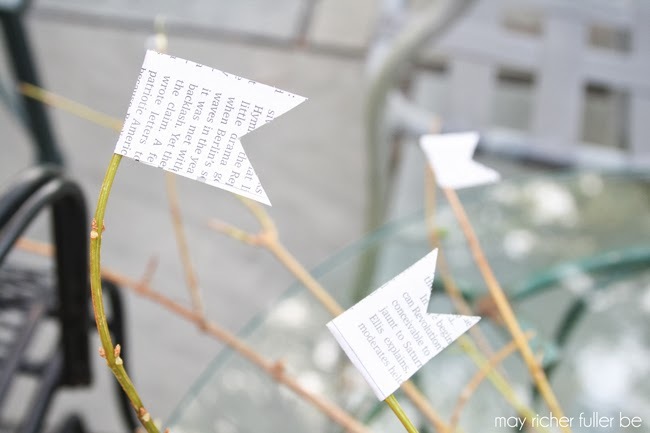 I've still got tons of leftover pages from my 5 Book Page Crafts series from a couple of weeks ago and I definitely could've used those. 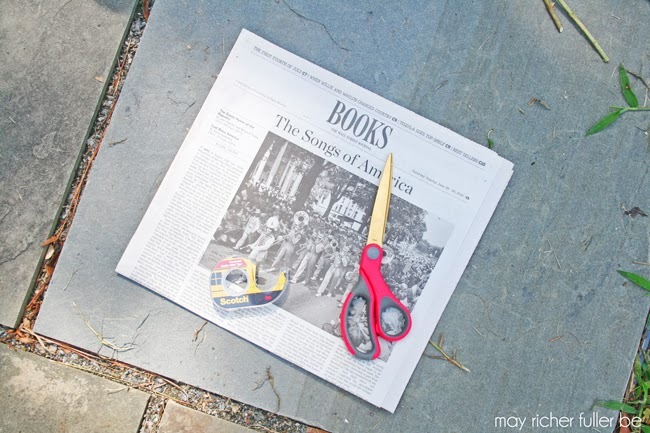 To make the flags, I cut long, thin (about one inch wide) strips of newspaper first and then cut those down into shorter strips of about four inches in length. 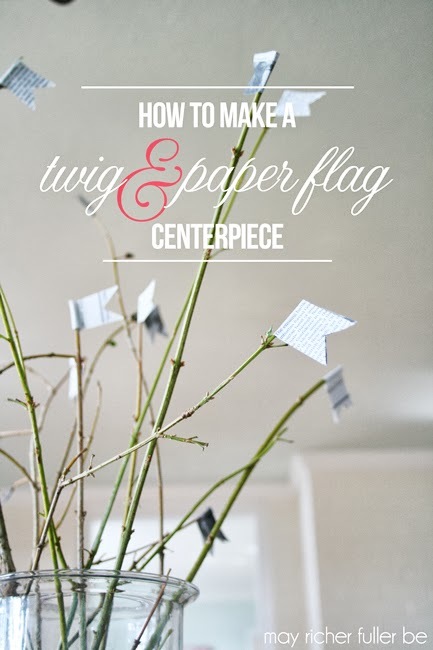 Step 3: Make your newspaper strips into flags and attach to the end of a branch. 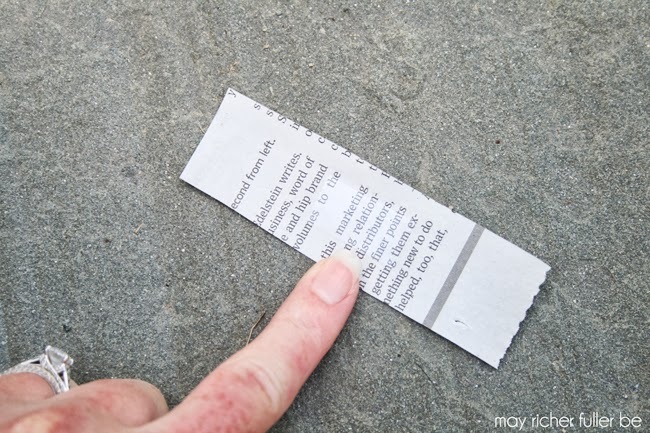 Place a short piece of double stick tape in the center of a strip of newspaper and then fold it in half around the end of a branch. Press together to make it stick. The tape should be touching the branch and itself so that it doesn't slide around. Repeat this step until the majority of the branch and twigs have flags on them. I liked the look of leaving a few branches "naked" so the flag placement looked a little random. Step 4: Cut notches in the flags. Use your scissors to cut "V"-shaped notches into the flags. How cute are these? 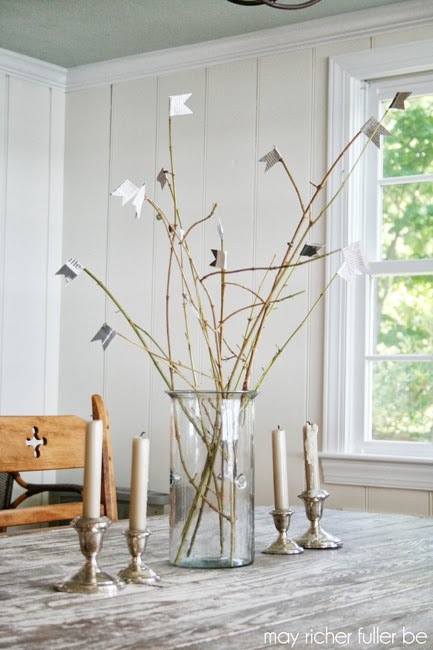 Step 6: Arrange your twigs and branches in a tall vase or container. I am by no means a pro arranger. I literally just stuck all the branches and twigs into this clear vase and tweaked it until I thought it looked right :). Again, I like the randomness and free-spirited look that the branches naturally have. All the neutrals in this room are so lovely. They make for a very calming space, don't you think? My mom has incredible taste and style - I'll have to do a tour of this house at some point. I just love it. And yes, that old farm table is fabulous (did I read your mind? ), as is the light fixture. The table is originally from the hotel that my great grandparents owned in Alabama. 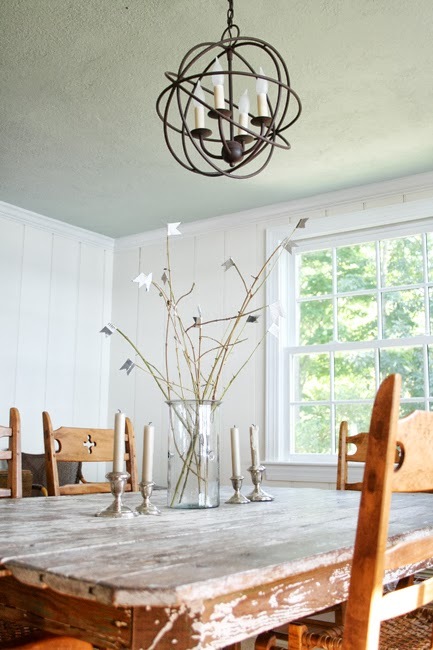 All that peeling paint is original - the look is from good old-fashioned wear and tear! So there you have it - a super simple project that cost me $0, very little time, and has a big impact without overwhelming the space! I think this piece would also look really nice on a mantel, sideboard, or entry table as well. How about you? 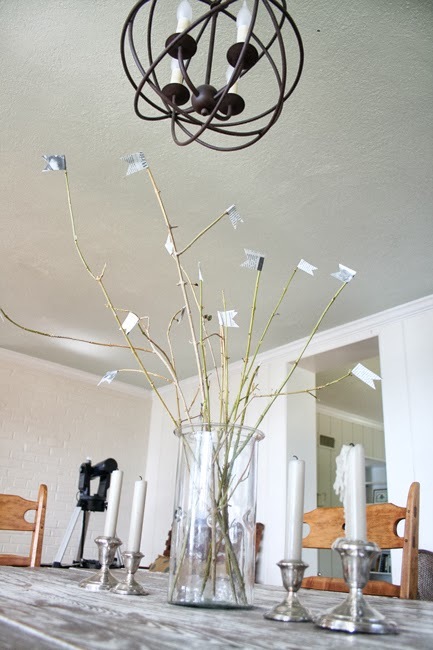 Have you taken on any simple projects like this one? I'd love to see! Oh that's brilliant! I love the idea of using it at a bridal shower. So many possibilities, huh? I love the little flags! I like decorating with sticks too! This is a simple yet impactful centerpiece! I am new to your blog so I may stay a bit and look around. Yes, you did read my mind! That table is UH-MAZING!! And the light fixture...oh my. What a beautiful space! 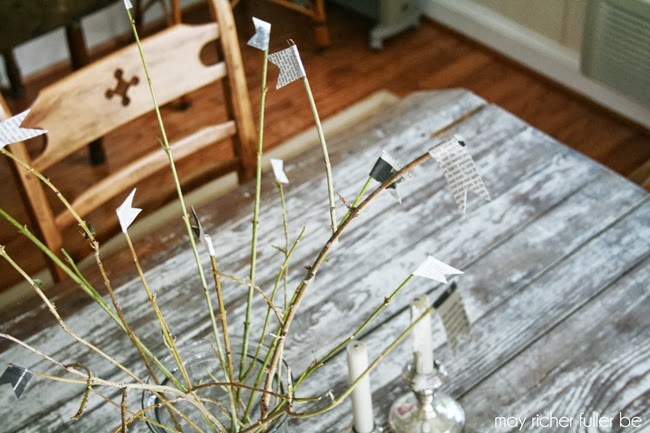 Very simple but cute centerpiece. With this could work for so many different table settings! I love what you have done. You should come party with us and show of your creativity. What a great centerpiece, and I LOVE that table!! Thanks for linking up at my Weekend Beautiful Blog Party! I love the simplicity of this and yet such a statement! Thank you for sharing with us at Give Me the Goods! You are one of my picks for features this week! Would love for you to come by my blog and grab your feature button!! This is so cute! Thanks for posting on Craft Frenzy Friday! Thanks Angela! Glad to have you here! !